Karimunjawa is a National Marine Park and it is also called the "Underwater Garden of the Java Sea, Karimunjawa: Java’s One-and-Only Island Paradise” Karimunjawa is a newly discovered untouched virgin paradise, Karimunjawa National Park can be a chief support become an object and power for attractive tourism, especially marine tourism or eco-tourism. Because of that, need arrangement and improvement of the tourism through the good side so can optimalize the utilization of natural potency without ignoring the natural sustainable and environment power syncronize with physichal area characteristic or sosio-cultural of the society. Since June 2016, there is 24-hour electricity in most places in Karimunjawa Island, though some other islands may receive as few as six hours per day. Designated as a national marine park. Karimunjawa consists of 27 small islands, the main ones being Karimunjawa, Kemujan. The main island is also known as karimun. Pupular Islands are Pulau Menjangan Besar, Menjangan Kecil, Cemara, Geleang, Pulau Kecil, Pulau Tengah, Pulau Parang, dan Menyawakan Islands. Karimunjawa is an archipelago in the Java Sea, Indonesia approximately 83 kilometres northwest of Jepara, off the Central Java coast, and about three hours by direct fast boat from Semarang. This mini archipelago became marine national park and it’s like a treasure for those who love marine life. Here can be found protected coral reefs (very colorful plateaus and plains in deep and shallow waters), secluded and tranquil white beaches, pelican and hornbill, sea grass and kinds of sea creatures, from crabs, anchovy, starfish, sharks, stingray, jellyfish, red snappers, etc. We will find mangrove forest and beach forest. The park is named after the largest island Karimun Jawa. The vegetation consists mainly of mangrove and beach forest, although there is some lowland rain forest on Karimun Jawa. Most of the islands are surrounded by sandy beaches and fringing coral reefs. Fresh water is confined to a few small wells and forest streams on Karimunjawa. A number of endemic animals live on the island while on the beaches sea turtles lay their eggs. The average tidal range is 92 cm. Most of the beaches in Karimunjawa Islands are white sandy beaches. 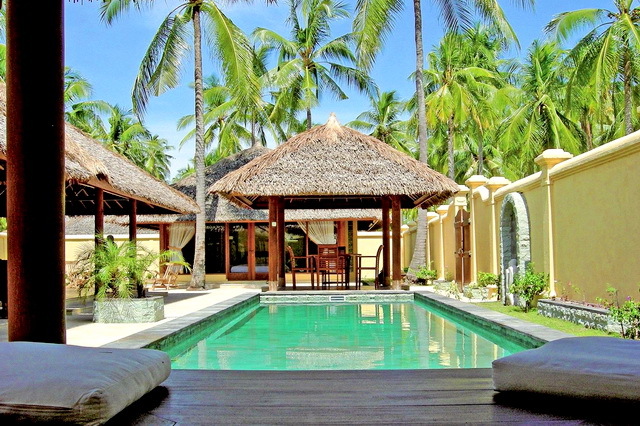 Here you will be free for leisure to enjoy and relax while swimming, sunbathing, and snorkeling. From 27 islands in Karimunjawa, there are 5 islands that are perfect for diving, snorkeling and fishing. Five of these islands are domestically inhabited and together with 22 others from the four major zones; Zone I is the core sanctuary area and is out of bounds to all, Zone 2 is the wilderness area open to limited tourism, Zone 3 is the utilization area, Zone 4 is the buffer zone. 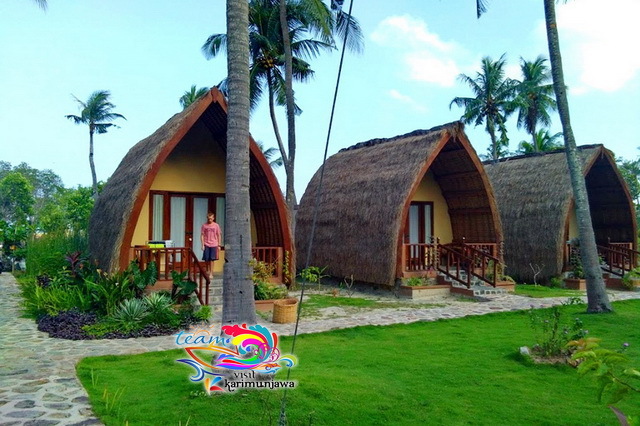 For you who are attracted for swimming or snorkeling, you can visit The Tanjung Gelam, Menjangan Kecil and Cemara Kecil Island, and You who prefer for sunbathing, the comfort places to visit are white sandy beaches in Menjangan Besar and Cemara Kecil. To see the marine life of Karimunjawa Islands, you can visit Gosong Cemara and Burung Island by rent a fisherman’s boat. Another activities are bicycle water, water surfing, hiking and camping specially in Karimunjawa and Kemujan Island. The visitors can also see The makam Sunan Nyamplung, He was a leader in Karimunjawa Islands, a historical place where the first Dutch Ship landed. To visit every island, the visitor can rent a motorboat. 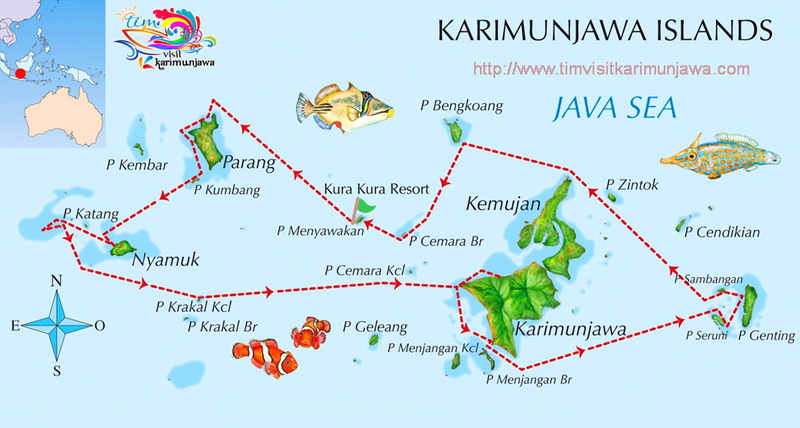 Up to this date Karimunjawa has 12 dive sites. Most of the diving is done on the fringing reefs around the islands, as well as submerged reefs, and shipwrecks. The sites are all to the west of the main island Karimunjawa offers good diving experience. Various small islands around Karimunjawa are available for diving and snorkling. Pulau Tengah, Tanjung Gelam, and Menjangan Besar offers you the most beautiful scenes you have ever seen in your life. The reefs have 35 types of hard corals, sponges, gorgonian, soft and red corals, mixtures of fringing, barrier, and patch with bottom depths ranging from 15 to 40 meters. During your diving time, you’ll be accompanying by amazing 240 or more variety of fish. Their variouscolour and size will give you a kind of feeling that you’re living in giant aquarium. You could also ask for wreck diving session at the island of Batu Kunci, Karang Kapal, Karang Ketel, and Batulawang. If you’re not familiar with diving, you can still enjoy the beautiful sea of these islands by snorkling, which is the safest way to see beautiful scenes down there. If diving and snorkling are not enough for you, swimming with sharks will give you more adrenalin rush. A shark’s captivity in Menjangan island serve you with numbers of various sharks. While your adrenalin pumped up to the highest level, it is really safe for you to swim around those sharks especially when local guide with maximum experience swims beside you. There’s nothing to worry about in this rare experience. Fishing is another good story of Karimunjawa, a fishing boat will happily takes you to the fishing spot of Karimunjawa island and few small islands around. Snappers, mackerels, squids and other kinds of fish are available here, to catch some fishes in the afternoon will give you stocks of delicious dinner along with fresh coconuts water from the coconut trees that easily found around the island. These can be done almost every afternoon in Karimunjawa. Gunung Maming, Desa Karimunjawa (Pulau Karimunjawa). located at west of Karimunjava square. Gunung Gede, Desa Karimunjawa (Pulau Karimunjawa). located at west of Karimunjava square. Nyamplungan Waterfall, Desa Karimunjawa (Pulau Karimunjawa). located at west of Karimunjava square. Lagon Lele, Desa Karimunjawa (Pulau Karimunjawa). located at west of Karimunjava square. Lorong Cinta, Desa Kemojan (Pulau Kemujan). located at west of Karimunjava square. Bukit Cinta, Desa Karimunjawa Dusun Jatikerep (Pulau Karimunjawa). located at west of Karimunjava square. Jokotuo Hill, Desa Karimunjawa (Pulau Karimunjawa). located at west of Karimunjava square. Nyamplungan Hill, Desa Karimunjawa (Pulau Karimunjawa). located at west of Karimunjava square. Kapal Batu, Desa Karimunjawa (Pulau Karimunjawa). located at west of Karimunjava square. Japan Cave, Desa Karimunjawa (Pulau Karimunjawa). located at west of Karimunjava square. Pertapaan Cave, Desa Karimunjawa (Pulau Karimunjawa). located at west of Karimunjava square. Tracking Hutan Mangrove, Desa Kemojan (Pulau Kemujan). located at west of Karimunjava square. Batu Karang Pengantin Beach, Desa Kemojan Dukuh Karanglawang (Pulau Kemujan). located at west of Karimunjava square. Ujung Gelam Beach, Desa Karimunjawa (Pulau Karimunjawa). located at west of Karimunjava square. Batu Topeng Beach, Desa Karimunjawa (Pulau Karimunjawa). located at west of Karimunjava square. Barakuda Beach, Desa Kemojan (Pulau Kemujan). located at west of Karimunjava square. Nirwana Beach, Desa Karimunjawa (Pulau Karimunjawa). located at west of Karimunjava square. Yamin Beach, Desa Karimunjawa (Pulau Karimunjawa). located at west of Karimunjava square. Annora Beach, Desa Karimunjawa (Pulau Karimunjawa). located at west of Karimunjava square. Kemloko Beach, Desa Karimunjawa (Pulau Karimunjawa). located at west of Karimunjava square. Do you want to travel to Karimunjawa? Excellent, go for it! Karimunjawa is an amazing place on earth. Here are our travel tips. To be honest: Karimunjawa is worth every effort. In short, the island is one of the most amazing places we’ve ever traveled to. These are our best tips for a trip to Karimunjawa. Most people travel to Karimunjawa by boat. There are three harbors in the North of Java: Semarang, Kendal and Jepara. We only travelled from Jepara’s harbor as it’s more frequent. You can either take the slow ferry or the speedboat. You’ll find the estimated arrivals and departures on this website, but please note that the times can change. Our ferry definitely left before 7 o’clock. We advise you to check if there even is a boat (wind, weather, whatever) and if yes, when it will be leaving. If you decide to go with the speedboat (we’ll talk about the advantages and disadvantages later), you better call the telephone number on the website above. 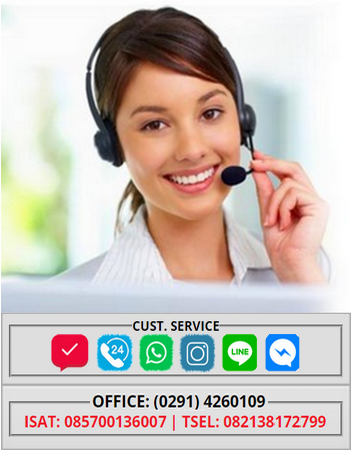 If you go within high season, you also better call the harbor and ask them to book at ticket for you. The slow ferry takes about 4 hours whereas the speedboat only takes 2 hours. We felt a lot safer on the slow ferry, although the big ship waved a lot (so does the speedboat). Traveling with the speedboat really scared us…. Fun fact: Plastic bags are included in the rate and are delivered by the cabin crew. Both options, the speedboat as well as the slow ferry, are not expensive: The ticket for the ferry is about 100.000 IDR, going by speedboat will cost about 200.000 IDR. Always check the waves before travelling. You can download the forecast here. Short explanation: Try to avoid pink areas around Karimunjawa. When all the other boats left, there is another option: You can charter a small fishing boat. This is actually no joke: We met a group of Germans who did so. It took them 8 hours on a tiny boat. On top of that, the motor broke on the high seas. Moreover, this horrible trip wasn’t cheap: they paid 7.000.000 IDR. Think twice before traveling with a fishing boat to Karimunjawa. There are regular ferries from Jepara, Semarang and Kendal, except during the monsoon season from December to February when the waves may be too high for a day or two, except in severe cases like on December 31, 2014 when about 500 tourists could not go back to Java due to 3.5 meters high waves and the ATMs ran out of money after 3 days, because some of the coal cargos also landed to avoid high waves and its crew also use the ATMs. Cash for at least 5 days should be prepared. Tanjung Emas Semarang is popular port for going to Karimunjawa, closer distance to the city of Semarang. At the moment the boat only departs 2 days a week from Semarang. If you wish to travel from Semarang, tickets have to be bought in the harbour before departure of the boat or you can book here. The most convenient and most easy way how to get to Karimunjawa is to travel from Jepara. From Jepara boats departure almost daily (except from Thursdays and Sundays). There are two different boats that sail from Jepara. The fast boat called the Bahari Express and the slow boat called the Siginjai. The fast boat takes 2 hours from Jepara harbour to Karimunjawa. The slow boat has a journey of 5 hours. Since the end of 2016 there is a fast boat from Kendal available. Kendal is at a closer distance to Semarang. At the moment the boat only departs 2 days a week from Kendal. Unfortunately we are not yet able to arrange tickets for this boat. If you wish to travel from Kendal tickets have to be bought in the harbour before departure of the boat. Another option is to fly from Surabaya with Airfast. The plain has a capacity of 12 seats only. Tickets can be bought at the ticket counter of Airfast in Surabaya only. At the moment the Airfast plain from Semarang is no longer flying. There are flights with Airfast from Surabaya to 1 Dewandaru Airport on Kemujan. You will need your passport to purchase tickets, and should arrive a good hour prior to departure. Try to book several days in advance for weekends and holidays as tickets sell out. 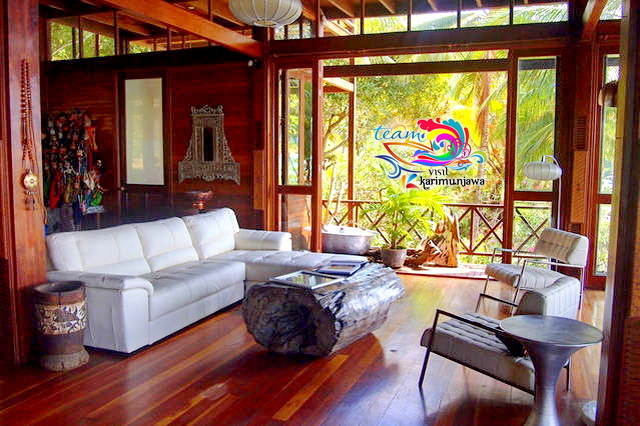 Guesthouse and tour operators on Karimunjawa can help prepurchase tickets for a small fee. Note: Schedules can change regularly and services are cancelled if there is inclement weather. In other words, a two-day visit can turn into five if the weather is bad enough. On Karimunjawa and Kemujan, you can rent cars or motorcycles. To get to the other islands, you can use a local boat or motorboat. It might be a good idea to book a rental car before you arrive in Karimunjawa because there are few cars there. There is no public transport at Karimunjawa, that’s why you’ll need a scooter to go around. The rent is about 75.000 IDR per day. There are no helmets at Karimunjawa: “No helmet, no police, no problem” like the owner of our Guesthouse said. The roads are sometimes in really bad condition but there is hardly any traffic except the neighborhood kids on their bikes. You can easily reach a lot of beaches with your scooter. Go to Tanjung Gelam Beach for nice sunsets. If you want to feel like Robinson Crusoe, head to Barakuda Beach and try to open coconuts with bare hands. Don’t miss the beautiful small islands around Karimunjawa. You can reach them with a fishing boat. A snorkeling day trip is 200.000 IDR per person. The island beaches and beautiful coral reefs. Many resorts in Karimunjawa, such as Kura-kura resort, provide diving activities. There are many interesting local spots for diving, like Taka Panyawangan and Gosong Cemara. There are some shipwrecks that attract many fish and divers alike. You can also go hiking around the island to find many places where there is a beautiful panorama. Surrounded by sea, Karimunjawa offers lots of seafood. Fresh fish and prawns are staples in the island diet. Restaurants are located within hotels. Other eateries, or warungs, provide decent cheap food like fried rice, fish, or an assortment of veggies. Be flexible and you'll do fine. There are various kinds of accommodation there, from the four star hotels to homestays. There are also camping sites. The best period for travelling to Karimunjawa is from the end of February until the beginning of December or As the rest of Java, Indonesia of a tropical climate, the best time to go Karimunjawa would be during the dry season of April to October where the weather would be consistent sunny but humid. Outside this period the boats can be a little bit unreliable because of the raining season. For more information about Karimunjawa’s travel period send us an email with your considered arrival dates and let us know if you have any concerns. We will give you a fair picture of risks and weather conditions. Last but not least we’re gonna show you some pictures of this divine island. Go there before it’s run over by tourists!